One of the secret pleasures of writing is that you get to live a double-life: there’s the reality of here and now, with it’s daily routine, but then at the same time there’s the daydream-world of whatever story you’re working through. So if I get bored of doing the dishes, or waiting in line at the grocery store, I can just slip into the crowded streets of New York, 1901, or a dusty road outside Jerusalem in 1665, or a polished apartment on the Ringstraße of Vienna – the setting for my next story that, because I’ve spent so much time imagining it, is always instantly, effortlessly there. “But you’ve only got to run the other way,” said the cat, and ate it. I’ve been in Los Angeles this week, visiting family. 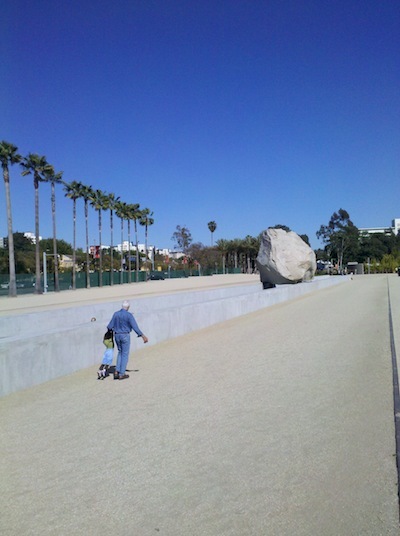 Although I’m not usually a fan of highly cerebral (as opposed to emotional) art, a highlight of the trip for me was Michael Heizer’s piece Levitated Mass at LACMA. 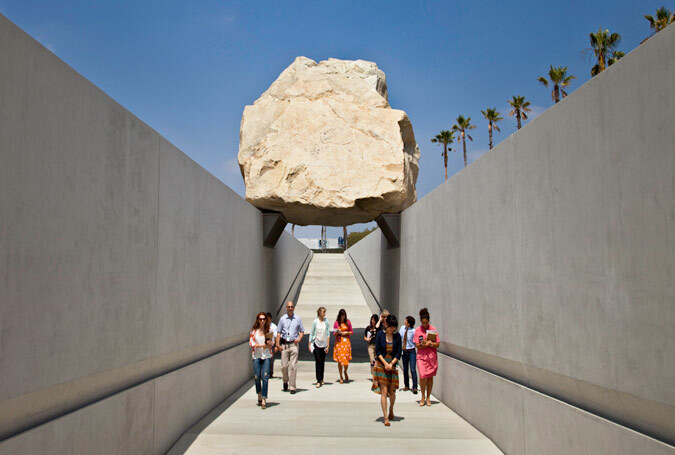 The sculpture consists of a 340-ton boulder perched on top of a long concrete trench, all of which is surrounded by a patch of barren dirt. To me, it’s a work that seems very much about ritual. First, the painstaking process of moving the huge boulder to its current location. Then the experience of visiting itself: little groups of people arrive, hesitate, take pictures. Talk, in the predictably comforting ways we talk when faced with the unfamiliar. (“Is it art?” “That’s not art!”) And finally, file down the long concrete corridor underneath the rock and emerge on the other side with the sense that an obscure something has happened. He tried, and failed, to imagine how any of this might have connected with Max and the (many, silly, passionate) things Max cared about – Max, whose greatest fear (Ernst often thought) was to be seen as conventional. after the waiter arrived with his fiaker, and he had downed the confection of coffee, chocolate and kirsch, he was – well, not exactly restored to himself (in fact he didn’t quite feel like himself; he felt like a character in some kind of…) but, at any rate, better. blinking against the brightness of the street he had the sense of waking from a disturbing but essentially implausible dream. He crossed to the window and opened it. Traffic moved along the Ringstrasse, screened from view by a row of trees; pigeons fluttered between buildings. The early summer day was hazy; there was a cool breeze and the light had a silver, particulate quality that made him think of the first whisper of autumn, with its intimations of change (the recommencement of school, the promise of a new, brighter version of oneself just around the corner). Ernst recalled this, and shivered with a momentary frisson. Because he understood that he would do it – and also understood that although stories allow us to make our lives meaningful, they have their sinister side. That the allure of seeing oneself as a character in someone else’s story is also the path to self-alienation. He gazed at her, holding his breath, and experienced a kind of vertigo as if he was standing at the ledge of a precipice. He watched her get up and begin to collect the dishes. He knew that he was being unfair (somehow), that he hadn’t explained anything…. But still he felt a sense of injustice, the wrongness of being misunderstood, and wondered wretchedly when it had all gone so…. Stories tell us that what time has taken (all that we have forgotten) is unimportant. To put this another way, stories give form to the compression and distension of time that is the substance of our lives. As one writer noted, Nothing is more objective than the ticking of the second-hand. But as anyone who has spent an hour in a dentist’s waiting room, or in the arms of a lover, can attest, not all hours are created equal. Time stretches, time flies by, despite all objective evidence to the contrary. And stories alone allow us to express this fact: the decade that can be summarized in a sentence, the minute that takes a hundred sentences to unfold.